The use of standard music notation to compose music in a variety of genres. The ability to play such compositions. Ideally the ability to transpose interactively "recorded" MIDI & Drum tracks to standard notation. The ability to print such notation as score sheets. The ability to do "regular recording" in the same tool (i.e., with microphones). I was curious about what's the best recording software for a classically trained musician, but one who writes indie rock/pop/folk/hip-hop/EDM? In fact, I'm not professionally trained, but I grew up around some top-notch classically trained musicians, and I know how to read music, and I enjoy scoring my own music in Finale-like applications like MuseScore or Notion. I'm still learning, but I can definitely sense myself steadily improving, and I am currently at a place in my life where I can pursue music as a profession, and I want to do some DIY projects to record my music (as well as work with experienced professional recording engineers). So if I want to continue to grow in terms of standard music notation composition/transcription, but also make "modern" sounding music with drums and synths (often not recorded, but just input directly from the [computer] keyboard), how can I "kill two birds with one stone"? I mean, I would be happy to focus on Garage Band, Fruity Loops, Audacity, Logic, etc. (though I prefer open-source/cheap software, and I prefer Linux, but not a deal-breaker if there's not Linux version), but I would like to choose a software package that is well-integrated with standard music notation. I don't know if any of these packages that the average "producer" uses would satisfy my standard music notation requirement, but if you know of any, I would greatly appreciate some advice. 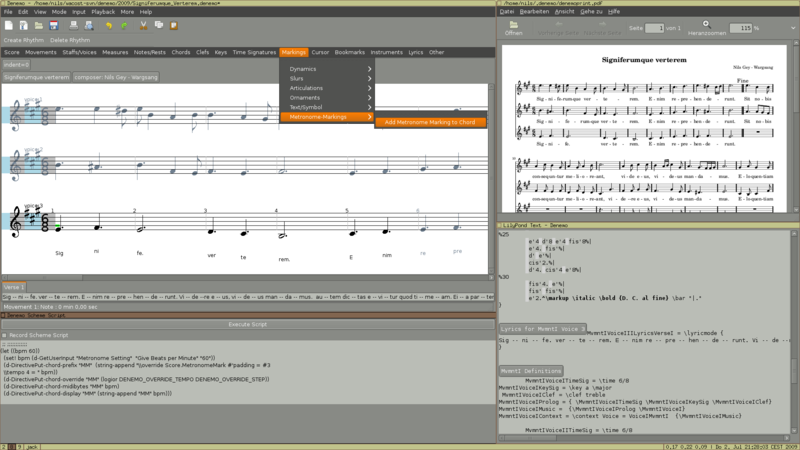 Produces sheet music in various notations vial LilyPond to produce beautifully typeset sheet music. Your music can produce prints, images and music files as well routing your music in real time to other applications. Support is there for creating the widest range of notation – Tablature, Chord Charts, Fret Diagrams, Drums, transposing instruments, ossia, ottava, cue, etc. Not the answer you're looking for? Browse other questions tagged open-source music music-production music-composing music-sheet or ask your own question.